The AMERICAN Fastite joint, furnished in sizes 4” to 64”, is a flexible, rubber ring compression-type joint used extensively in underground service for water, sewage or other liquids. It has the proven long-life and high-strength qualities inherent in pipe produced centrifugally in accordance with AWWA C151. In addition, this significant AMERICAN development, a dependable, single gasket, push-on type joint meeting the requirements of AWWA C111, affords the customer lower joint cost and time-saving advantages in installation. Fastite joint pipe provides exceptional strength and flexibility and has been widely accepted by engineers, contractors and utility officials since the 1950s. For added flexibility during construction, and for possible elimination of bends, a liberal 5° allowable deflection is standard in all sizes through 30", offering 21" offset in a 20’ length of pipe. Liberal deflection can also be provided in larger diameter pipe with standard and special Fastite deflection bells. The patented AMERICAN Fastite joint embodies many advanced design features and is rated for a water working pressure of 350 psi. For specific conditions, ductile iron piping with this joint has been approved for higher pressure conditions. The socket, which is scientifically designed with two gasket recesses and a dividing buttress, is manufactured to close tolerances so that the gasket is self-centered, securely confined, and firmly compressed for a permanent, tight, trouble-free joint. The Fastite joint seal, bubble-tight under vacuum and external pressure, becomes even tighter with the application of internal pressure due to a specially designed wedging surface in the socket. 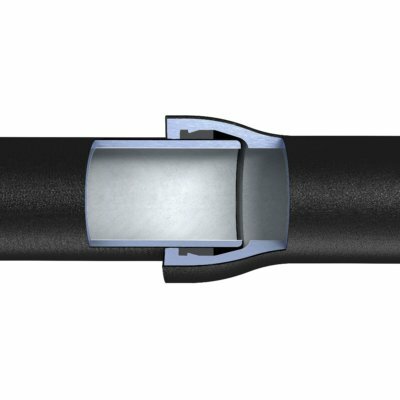 The Fastite joint pipe bell opening is slightly tapered to provide easy entry of the pipe end; the flared socket design permits liberal joint deflection. The plain end of the pipe is tapered or rounded to facilitate entry into the bell and self-centering in the gasket. On pipe cut in the field, the plain end can be easily beveled and smoothed by the use of a portable grinding wheel or other suitable apparatus. A stripe is painted on the plain end of AMERICAN Fastite joint pipe to provide a visual means of checking the joint alignment and to assure proper insertion.